Bronze Art Sculptures Loveland: Why Does Bronze Matter? If you have ever wondered why so many statues and busts seem to be crafted from bronze, then you are not alone. In today’s post, we will take a look at why bronze is such an important metal in this particular art form, as well as look at a brief history of statues and busts. At James Nance Sculpture Studio in Loveland, we create both bronze statues and busts for clients. Be sure to call today and order your piece of bronze art. Bronze is the most popular metal for sculptures because it can be used for statues, in reliefs, and for small statuettes and figurines. Common bronze alloys have the amazing property of expanding just before they set, which means that they fill the finest details of a mould. As it cools, it shrinks just a little, allowing it to be more easily separated from the mould. When the piece that is being created needs to show action, bronze is once again the best choice due to its strength and ductility (lack of brittleness). Bronze alloys contain the best of the metals that make them. Traditional ratios for bronze used in sculpture making are approximately 97 percent copper, two percent tin, and one percent zinc. The heavy ratio of copper to the other metals is what gives bronze is malleability and ductility. While the ratio of tin and zinc is incredibly small, they produce the hardness needed that allows bronze statues to stand the test of time. When you admire a bronze statue, you probably aren’t thinking about how easy or hard it is to keep clean. However, this is one of the reasons that sculpture artists choose to work with bronze. Cleaning and maintaining the original appearance is both affordable and easy. Simply use unscented dishwashing soap to clean the sculpture, and then finish the job by waxing it with commonly available products. For those who prefer the bright green coating that occurs from natural oxidation, however, you will need to do nothing but watch the changes and enjoy. Bronze is a popular medium because it is also able to be worked into incredibly intricate details. 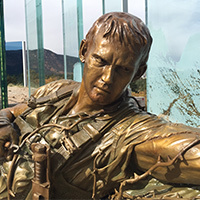 As it is a copper-based alloy, it has a lower melting point than steel or iron, which allows the artist to cut minute details into the bronze casting. Once the casting has hardened, the details will be preserved in the sculpture through the expanding and shrinking effects that we mentioned earlier. Copper is a soft metal, which is why it is important to use a copper alloy to create the bronze. Bronze is a much harder metal and will retain these details over time, in even in outdoor conditions. When you consider these three aspects of bronze, its physical properties, easy care and maintenance, and its ability to hold elaborate details, you can understand why bronze was, and probably always will be, the favorite medium for bronze art sculptures. If you are interested in learning how you can order your very own bronze statue or bust, then please contact James Nance Sculpture Studio in Loveland today. We look forward to creating a piece of art just for you!